First Blog Results in 3 Unbelievable Business Opportunities! I was really quite flattered when not long after I ‘published’ my first blog in this forum, I received some attention in the way of a ‘like’ from a fellow blogger, and a message to follow his blog too. I looked at his page and saw that it was very well done. Quite sophisticated and up to date with all kinds of interesting media to flip through. I liked, as in appreciated, the post that was at the top of his published works. Nicely written, nicely inspirational. Even more impressive was how young he was – only 18 yrs. So, I then ‘liked’, as in hit the like button, on his page, and even clicked on the ‘follow his blog’ button. Not long after, I started receiving inspirational messages from him in my email inbox that included ideas on how I could change my life, by changing my financial circumstances, by learning a really, super cool way to earn a living via my blog! This guy did it and look, he’s only 18 and already retired in the Thai jungle of his retirement goals, as being demonstrated in the video of himself telling me so. The terms to describe it were right up my marketing background alley. Though slight, the description sounded reasonable and plausible. So, I followed the links as directed and got to a 45 minute video of two guys sitting comfortably in poolside chairs in front of a beautiful interior pool of an obviously expensive house. My gut instinct started to kick in. They started talking about their backgrounds and, kind of like young Blog guy, they described how they started from nothing, with no prospects. One had actually lived out of a van that cost less than the pen he was holding in his hand now. The beautiful house on display was his, and we wouldn’t believe all that he now has and has achieved after figuring out – are you ready for this? 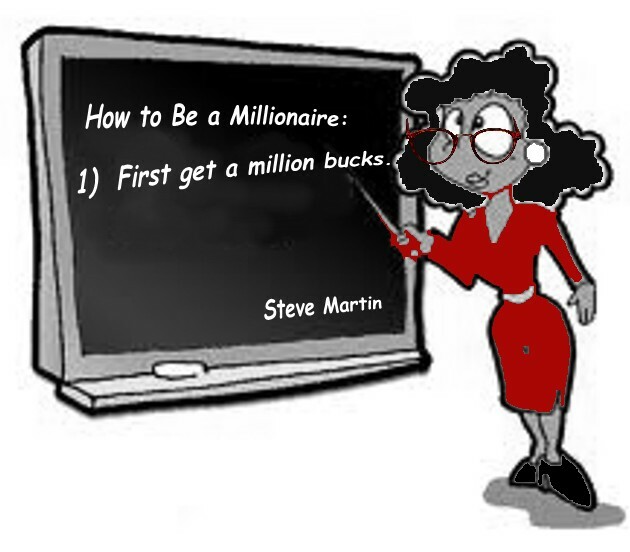 – a simple, 3 step idea for making millions via the internet. About 20 minutes into the story about how hard life had been for them, and all they did was put a little effort into the still unexplained way they did it, another screen flashed up under their picture. If I act now, for only $25, I will learn the secret simple 3 step plan for making millions – or as much as I am willing to work for, it’s all up to me – but I better hurry because there are limited spots left. Gut instinct confirmed, video turned off. Hmpff! The not so secret ‘secret’ was revealed and my sense of flattery about having blog skills suppressed. Hey, maybe I did miss an opportunity to ‘retire at 18’, but I’m going to trust my gut on this one. If it’s meant to be, there will be another opportunity not far behind. What this did do was get me thinking about all these pyramid, or multi-level marketing, type of schemes that come up over and over. Sometimes they come with genuine product offerings, but mostly they are about the quickest immediate cash grab for the idea guys. I can’t even begin to count how many of these pitches, ads, infomercials I have seen, and you know what they all have in common? Vans. Did you ever notice that too? Almost every one of these self-made from dirt poor guys who luck-out on the answer to millions, start out by living in vans. Really shaky rickety vans too. I am going to re-think my plans for my son’s formal education plans after high school. I’m going to just shove him into a van when he is 18, and say, “Go forth, my son, and prosper! Bring me back one of those expensive pens when you’ve made it”. This has given me another idea, a way for me to make a really good living too. I’m going to go into the old van selling business. Low overhead, because they’re all old and about to break down anyway. We’ll sell them to these young guys for only 250 bucks. Who’s in with me? Time limited offer. Oh, and my son gets his half-price. 1 Response to First Blog Results in 3 Unbelievable Business Opportunities!